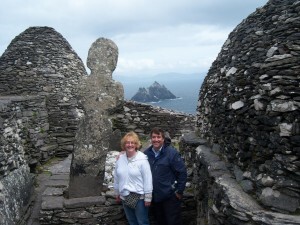 Skelling Michael is a large rock island off the coast of southern Ireland by County Kerry. It can only be reached by a boat that traverses very rough waters. If the weather is right you may be allowed to cross those waters and enjoy a two hour stay on the rock. Its most important features are an old monastery from the 7th Century and when in season it is the home to hundreds of puffins. 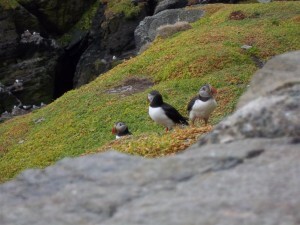 It is the puffins and a suggestion from our host that prompted me to schedule this trip. Our trip began on a mostly sunny day out of the pier at Caherdaniel. We boarded John O’Shea’s boat along with his four small dogs, a couple from the Czech Republic and their dog, an Irish couple from Scotland, and us. The two hour ride was a bit rough and the winds quite cool. Shivering we climbed out of the boat and began to look for puffins. It didn’t take long. They were perched everywhere and quite accommodating for pictures. A guide gave us a list of suggestions for how to get to the top of the rock by climbing an ancient path that would take us to the monastery. Allowing peer pressure to help me forget my fear of heights, Mike and I began the steep climb of 600 steps to the top. You feel like you are on the side of a mountain. Along the way we stopped many times for a breath, a view of the sea, and to look in puffin roosts for the colorful birds. Encouragement from the tourists going down helped us to reach the top. There are several stone, domed shaped huts, with a small cemetery and a Celtic like statue. There were supposed to be guides to explain all this but we never saw or heard from them. Six hundred steps up to the top to see a 6th Century monastery! As we gazed across the Atlantic, a dark cloud was quickly approaching the area. We descended down and saw that the sea had become particularly choppy. Our boat arrived, John advised us where to sit so that we would not wet. Unfortunately due to the high winds, no place was safe from the water and we got drenched. Swells came and went like a roller coaster. 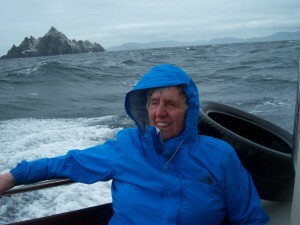 My mother found a corner that allowed her to hold on to her place but it was prime for a good dousing of water so she was very pleased that her new waterproof jacket seemed to live up to its reputation. Mike and I sat across from her but had nothing to secure us down but our seat and at one point I tipped forward. Hands reached out and I only hurt my dignity. We tried to make light of it but when the boat finally reached harbor, we were wet, cold, stiff, and numb. The couple from Scotland invited us to their lodgings for a cup of hot tea, some towels and a hair dryer to help thaw us out. We teased as to the efforts we were willing to go to, to see a puffin in its natural habitat but Mother declared it was the highlight of her trip, not necessarily the best thing she did but the highlight. Mother going back to her "naval roots."